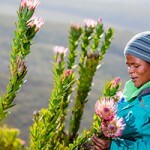 Invasive alien plants pose a major threat to the fynbos kingdom. 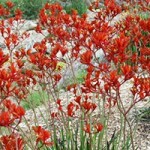 A recent study found they cost the Cape Floristic Region around R700-million a year to manage. The wild flower industry, in particular, is hard hit by alien plants. However, many land users are unable and unwilling to clear aliens due to the high costs associated with this. The Agulhas Plain is no less affected by invasive alien plants and given the region’s biodiversity importance globally, it’s important to tackle the problem. But aliens need a coordinated region-wide strategy, if clearing is to be successful. Without coordination, collective action and follow-up, aliens simply re-grow, and land users re-infest each other’s property, thereby wasting the scarce funding that is available for alien clearing. Through a major donation by the Drakenstein Trust, Flower Valley Conservation Trust hosts the Agulhas Biodiversity Initiative area’s alien clearing coordination efforts. A working group meets regularly to assess alien clearing activities, priority areas, and alien clearing needs. It serves as a vital hub for land users, conservation organisations and government to meet, to collectively work towards alien eradication. Flower Valley, through the Agulhas Biodiversity Initiative, also works with various land user groups (including emerging land owner associations). We assist in collecting vital data on alien infestations, and help to access funding to clear key areas of alien plants. There is, however, an upside to invasive alien plants: they offer opportunities for job creation and income generation. Alien clearing programmes can employ many unemployed youths, while offering them business skills as they run their own teams. The Agulhas Biodiversity Initiative works to find these opportunities, and to source funding where possible from the private and public sectors. Alien plants can also generate an income albeit, usually sufficient to cover the costs of clearing them. As such, investigations continue into opportunities such as making charcoal and briquettes from cut alien plants, and using aliens to produce green energy for households by installing the necessary technologies. We continue to look for opportunities, and to access the necessary funding to make these become a reality.